The Raspberry Pi solar data logger project is now live and is the latest version of our previous data logging systems using Arduino and Android + IOIO board projectsThe Raspberry Pi is used as a data processing and uploading system which pulls data from the following sensors and then uploads to a web server via HTTP GET.I2C home temperature sensor Microchip MCP98031-Wire DS18B20 temperature sensors on Solar hot water collector input pipe, hot water cylinder top and base and also an unused temperature sensor in the box containing the Raspberry Pi board and interface boards.Mains current Elkor i-Snail-VC Current Transducer 0 to 100 Amps which produces 0-5V DCLow voltage current sensors using ACS712 30A Current Sensor Modules (sourced from ebay)The Raspberry Pi ADC board uses a pair of Microchip MCP3428 16-Bit, Multi-Channel Analog-to-Digital Converter with I2C™ Interface chips with low pass filters and voltage dividers on the inputs to bring the 0-5V range down to 0-2.048 which the chips can process. [more]The completed install showing the Raspberry Pi box to the right with the 1-Wire USB interface and network cable and solar PV system to the left.The python source code for this project can be downloaded from github.com/briandorey/RaspberryPiSolarLoggerThe OWFS One Wire File System is required, download from owfs.orgThe Quick2Wire library is used for the I2C communication, download from quick2wire.comSide view of the interface board showing the DC-DC power supply. There is a small rubber foot which holds the board off the HDMI socket on the Raspberry Pi. anyone tell me. actival cost of the project. 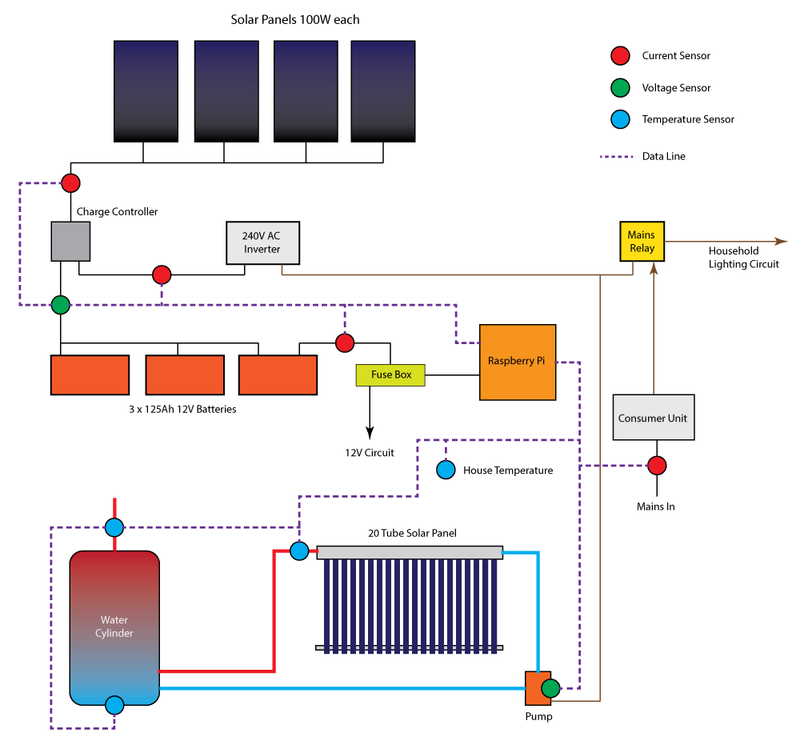 I see you want to build a system, which heats your home running off solar power, good idea however the element to heat the water is like a massive kettle right? Be careful with the current monitor as it does pick up magnetic field too easily and could give the pi incorrect readings. I would use software filtering while the system is in operation, however this would also require a good multimeter to ensure you've got the correct readings during calibration. I'll be nice. Youtube link is dead. You should have put more time into laying out your build.One running sentence with links in it? The first 50 projects I read on Instructables actually had instructions. Better to lurk other Instructables comments and link your blog or put it on Pastebin. It's looks intelligent no doubt. IF more people post like you have, without someone moderating, everyone's experience will end up like Myspace. Hectic. DIsorganized. The battery temperature data is valuable info for deciding when to buy new batteries. Don't forget to measure battery temperature! Over the years, the batteries slowly degrade in performance, until they are for all practical purposes, resistive heating elements because they are no longer converting electrical energy into chemical energy. So if you throw 800 watts at them, they just get hot (conservation of energy principle) instead of storing energy. and all the data collected i need to save it on a .txt archive, this archive must be a "daily report"
can you please elaborate what is the purpose of this project? I would love to see if I could get this to work with my aquaponic system. I see one image at the top of the I'ble but can't read it. Can you post a much larger image of the system? Thanks.